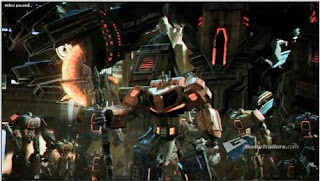 The Daily Chow: Transformers Cybertron Epic Win Pre-Perceptions!!!! Transformers Cybertron Epic Win Pre-Perceptions!!!! If you were to ask me what my two of my most die-heard loves are, I would stand in a superhero stance, with confidence, and say "Transformers and video games". Put the two together and you have the recipe for either disasters of epic proportions or something so grand that words wouldn't do it justice. As an 80's baby who can remember rockin' the cap with the mirrors on it, neon green fanny pack and swearing up and down that Astro Boy was my BFF, I'm a solid G1 Transformer junkie that took a long time to understand that sometimes, things do have to be modernized with the times and go through changes. While I still have issues with the movie series and the previous transformer games that have come out, I will say based on reviews, game trailers, game play vids and this end credit scene, I'm thoroughly impressed and can't wait to start playing this game. I have a $50 credit to Gamestop and I know what it's going to. I'm glad that they kept some of the G1 flare to the character designs and the entire game concept. Check out the game credits below and if you guys have started the game already, tweet me your thoughts!